You grew inside me, your teeth and your tongue and your cervix are all made from my cells, my genes. Who knows what little surprises I left growing inside there for you, which codes I set running. Breast cancer? Alzheimer’s? Like other first-person narratives with neurotic or lonely voices (Spill Simmer Falter Wither and Pond, both 2015, come to mind), we get the feeling that Eleanor is telling her story very much to herself. This is reinforced by her posing of questions that go unanswered; musing on the chance of her dying alone and undiscovered in her flat, she asks: ‘Would the officers break down the front door? Find me, covering their faces, gagging at the smell?’ She says of a wedding: ‘I sat on my own and no one asked me to dance and I was absolutely fine with that.’ But the emphasis betrays a false conviction. Eleanor pontificates on a multitude of trivialities including cafeteria cutlery, wedding lists, and the brewing of first flush Darjeeling. Everyone has foibles, but for lonely people, these mutate into something more precious. She fills the emotional hole with books, reading whatever she comes across on the shelves of charity shops. This, together with an absence of close human contact, means her vocabulary is formal, bulging with anachronisms; she buys ‘comestibles’ and ‘divests’ herself of her clothes. Eleanor is full of contradictions. She likes sausage rolls from Greggs, and Suetonius’s The Twelve Caesars. She has mittens on string and shoes with Velcro fastenings, but finds trendy Raymond’s duffle coat childish. Her Power Rangers clock, a fondness for Alphabetti Spaghetti, and her frog-shaped pouffe might cause us to sneer were it not that they counterpoise our realization that Eleanor is a product of living the same empty existence for more than a decade. Seen through Eleanor’s eyes, society becomes a strange place. She knows nothing of popular culture: she mistakes Zumba for a person, and Arnold Bennett for an omelette chef. While amusing, perhaps too much of the humour relies on this de-familiarization; towards the end it feels repetitive. Eyelids are really just flesh curtains. Your eyes are always ‘on’, always looking; when you close them, you’re watching the thin, veined skin of your inner eyelid rather than staring out at the world. I’d made my legs black, and my hair blonde. I’d lengthened and darkened my eyelashes, dusted a flush of pink onto my cheeks and painted my lips a shade of dark red which was rarely found in nature. I should, by rights, look less like a human woman than I’d ever done, and yet it seemed that this was the most acceptable, the most appropriate appearance that I’d ever made before the world. The crush ends badly, and gradually Mummy’s mischief-making fades; when her weekly phone calls cease altogether two-thirds through the narrative, it feels frustrating: her mother was darkly comic and her periodic presence affected an engaging change in tone. From here, the story focuses on Eleanor’s salvation. Counselling sessions are sensitively portrayed: ‘The sky didn’t fall in, Mummy wasn’t summoned like a demon by the mere mention of her name.’ Perhaps the plot’s fatal flaw, the hamartia as Eleanor would say, is that anyone this broken is unlikely to become whole again, and the dipsomania and obsessiveness seem too easily resolved. But if we lose something of the truth in this, it’s because the novel is one of hope and transformation. As an exploration into the effects of acute solitude, we find Eleanor’s social interactions hampered by emotional agnosia. The book’s epigraph is a quote from Olivia Lang’s non-fiction work The Lonely City, about lonely people being ‘less adept […] at navigating social currents’. With recent Guardian headlines like ‘Loneliness is harming our society’ and ‘Loneliness as bad for health as long-term illness’, Honeyman’s debut feels timely and relevant. 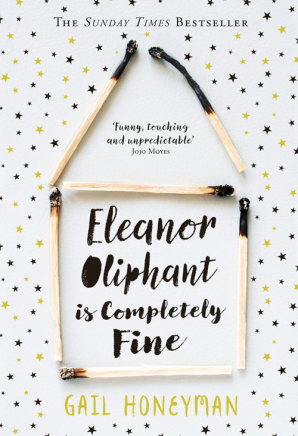 Eleanor Oliphant is Completely Fine by Gail Honeyman is published by Harper Collins, 2017. Laura Morgan writes fiction and criticism. She is published in The Moth, Causeway/Cabhsair, Northwards Now, New Writing Scotland, The Scottish Review of Books, and others. A recipient of a Scottish Book Trust New Writer Award, she’s currently working on her first short story collection She blogs at aremoteview.wordpress.com.